I’ve posted about this topic before, but, seeing as I just received my first pair of Oasis Dance Sandals I thought it would be nice to revisit the topic of protecting your feet. Protecting your feet is vitally important for your health as a dancer. Going barefoot on stage presents a whole host of hazards, from broken glass on a restaurant floor to splintered wood stages, your never know what is underfoot, until it is too late. The trade off for protecting your feet can often come at the expense of your dance itself. Traditionally, belly dance is taught barefoot. You ground yourself, learn to turn, balance and travel on the soles of your feet. When you place something between you and the floor you have a new variable to contend with. Shoes that are have too much grip will cause unnecessary pressure on your knees, which can result in injury. Heels that are too high can throw off your balance, change your posture, and limit your movements. Sandals that are slick on the bottom can make you slip, ruining your turns. After last years dreadful experience on a super heated stage, I vowed to never again dance bare foot outdoors. I own quite a few ballroom shoes, enough to match every costume I own, and I have several pairs of ballet slippers. My go to outdoor shoe is generally the “teaching sandal.” The pink leather matches my fair skin tone far better than tan ballet slippers and the small heel gives these shoes a small edge in the elegance department, but they never felt very “middle eastern” to me. The standard hermes sandal looks right at home in the deserts where our dance was born, but I was never able to get past the unflattering dark grey brown color from most manufactures. Enter Oasis Dance Sandals – these handmaid sandals are crafted with the dancer in mind. You can even opt to get a completely custom sandal created. No more awkwardly placed toe strap. I ordered the sandals, in champagne and natural and within a couple of weeks I had a new pair of shoes! When I saw the package on the front stoop after my morning run, I had to try them on! Besides the shoes, Oasis sent a packet of leather samples for additional colors for the laces. 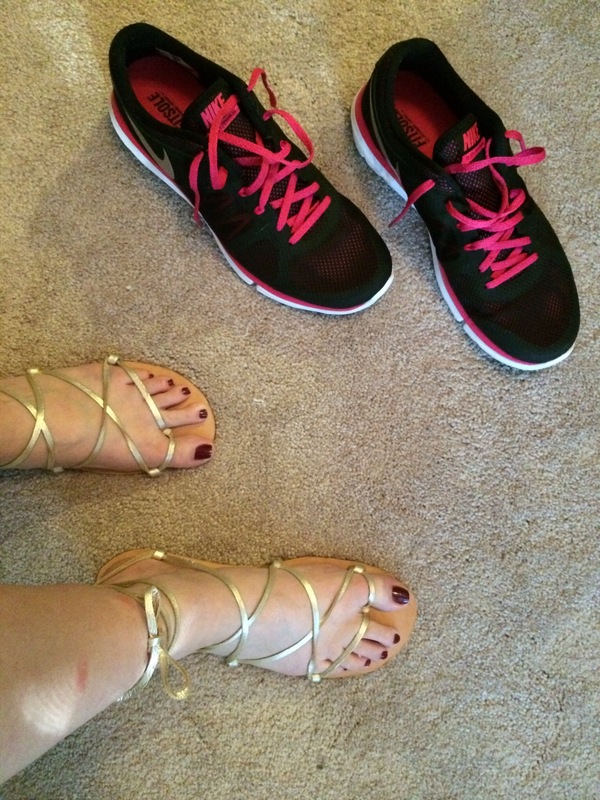 I went with the “Tahiti Barefoot Sandal” – the main feature of this one is the lack of heel strap. The bindings hit just above the ball of the foot, just above the arch of the foot, and at the middle of the heel, as well as between the toe (optional). I found that once the laces were done tightly this set up kept my foot firmly in place without any slipping off the sole of the shoe. Brand new, the soles were VERY slick. It was a conscious effort to not ‘ice skate’ down the hall. Before I did the standard twist and grind on the pavement to roughen up the soles I added a small adhesive grip to the heel. This gives me the maximum amount of traction, when I need it while still maintaining the dancers sole that I need for spins and turns. I can scuff along easily on the ball of the foot, protecting my knees from unnecessary torque while dancing, yet I can make a full stop after a flurry of Turkish styled spins by simply putting my foot fully on the floor. To date I have only used these beauties in indoor studio spaces, but I am happy to report that I was not hindered in any way while dancing with these shoes. They felt natural, molded to my foot as I danced, and looked great on! Sandal straps come in a multitude of colors (even metallic). Customization: Chose your exact size or create a custom lacing structure just for you. Flexible dancer sole WITH a comfy padded insert built in. Handmaid look – the edges of the leather sole is not cut perfectly. Overall, this is an excellent product, and one of the best looking Hermes sandals on the market. Sumaya is not paid to endorse this, or any other product.